We provide a link to the full paper to be viewed and downloaded below. 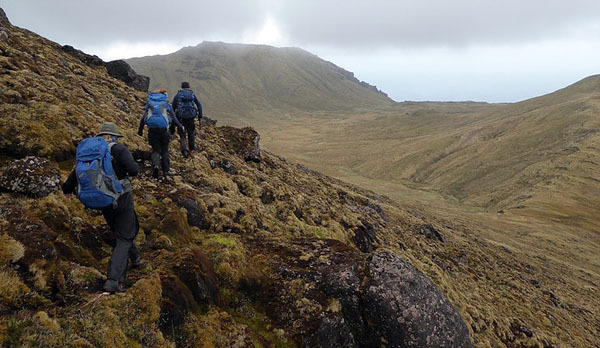 As part of the Tristan Government's efforts to carry comprehensive news of conservation work we publish the following summary and images of Gough Island and the relevant work there. A male Tristan albatross on Gough Island with wound on its lower back in March 2018. Invasive house mice Mus musculus are significant predators of seabird chicks on islands where they are the only introduced mammal, but there are very few records of attacks on adult birds. 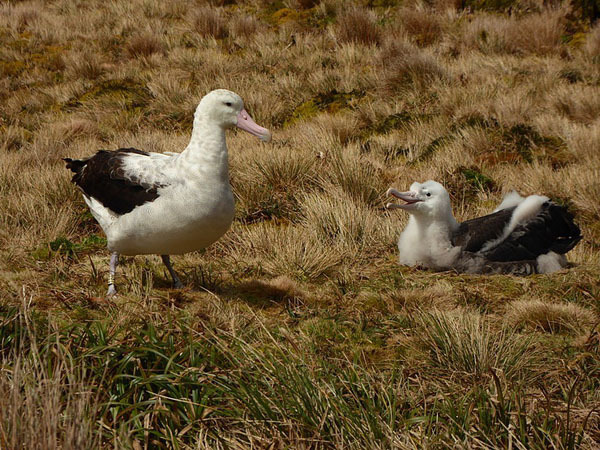 The team reports the first evidence of mouse attacks on adult albatrosses breeding on Gough Island, where there has been a recent increase in attacks on seabird chicks. 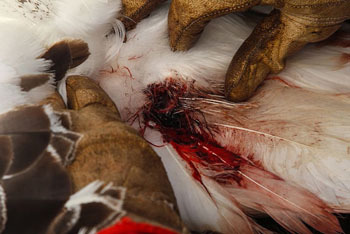 In March 2018, an incubating Tristan Albatross Diomedea dabbenena was found on Gough Island with a typical mouse wound on its rump. The egg hatched, and the same bird was later seen brooding and feeding the chick. 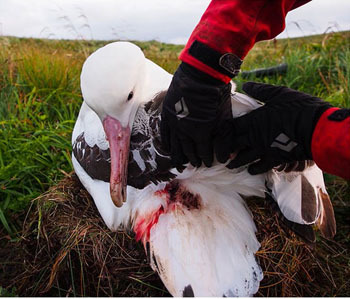 In October 2018, an incubating Atlantic Yellow-nosed Albatross Thalassarche chlororhynchos was found on Gough Island with a wound on its back suggestive of a mouse attack and 23 freshly dead carcasses of this species were found, next to empty nests, in nearby colonies. These observations add to mounting evidence of the impacts of mice on seabirds, and further support calls to eradicate mice from Gough Island. One of the survivors. A 5-month old Tristan Albatross chick begging for food from a parent.